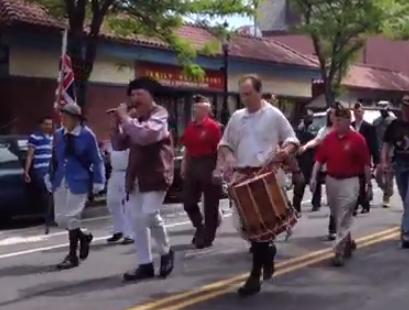 For Memorial Day last weekend, I am posting a video of a small parade in my New England town. 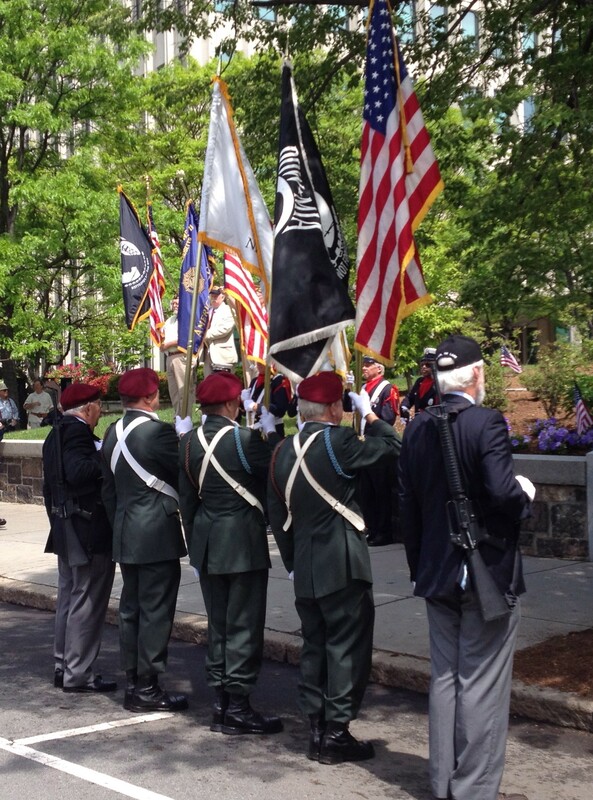 There were the usual representatives of the Armed Forces without whom no Memorial Day parade would be complete, accompanied, as always, by bagpipes, a tribute to the many people of Irish descent who have historically lived in the Boston area. If you read through a list of names of police officers and fire fighters in Boston and the surrounding towns, you will still see a goodly number of Irish names–whole families, with grandfathers, fathers, uncles, cousins, from the same families–though there have been some small recent attempts at diversity. No New England parade is ever complete without a motley crowd of “colonials” with their fifes and drums, and indeed, we had a few of them, playing “Yankee Doodle Dandy” and other Revolutionary War-era songs. “Yankee Doodle” was the name that the British mockingly called the colonials during the French and Indian War (the song dates from around 1755), but instead, the colonials adopted it for themselves and mockingly sang it back at them. And again, only in New England, is a banner for the “Daughters of the American Revolution” followed by women of this heritage (see the video). Being a member of the “Founding Families,” such as a Daughter of the American Revolution, used to be a very prestigious thing, but now it’s mostly forgotten, except by themselves. 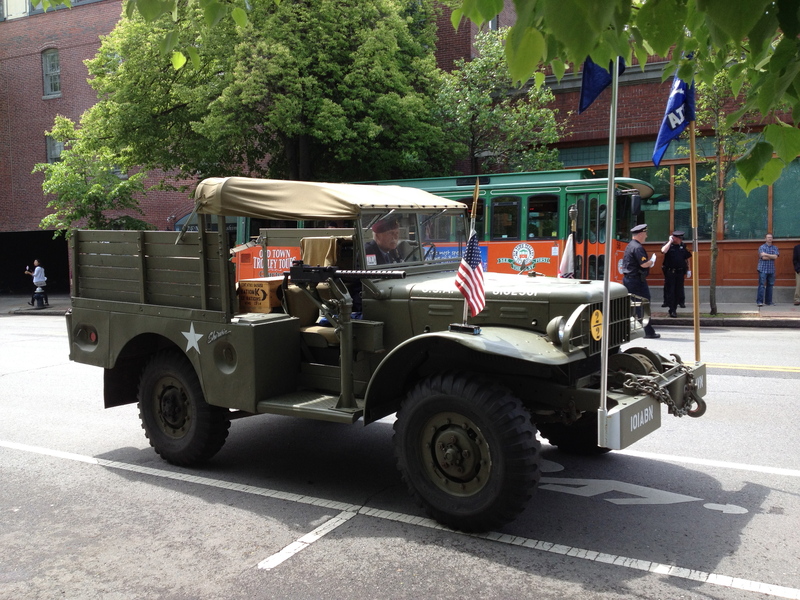 The rear of the parade was brought up by a World War II “ammo truck,” followed by our Town Selectmen and various people. On Memorial Day, a three-day weekend, many people leave town to go to visit their families or stay in their country homes on Cape Cod and in Vermont, New Hampshire, Maine, or other nearby states. The large town celebration is several weeks later, on Flag Day, which includes the colonials with their fifes and drums, and also a wide assortment of Town officials and groups. On this Memorial Day I am remembering my grandfathers and great-uncles who fought in World War I and II, and all of the millions of others who have given their lives for their countries.